It’s Friday, it’s raining, I’m carousing the alleyways of Manchester, the objective, something, quick and tasty to keep the cook twit ticking along until the toil of honest graft (you work in an office! – Ed) switches into a torrent of unbridled wonderlust that heralds a new weekend. Hark, what have we here? It’s the old Jack Spratt gaff with a new sign. 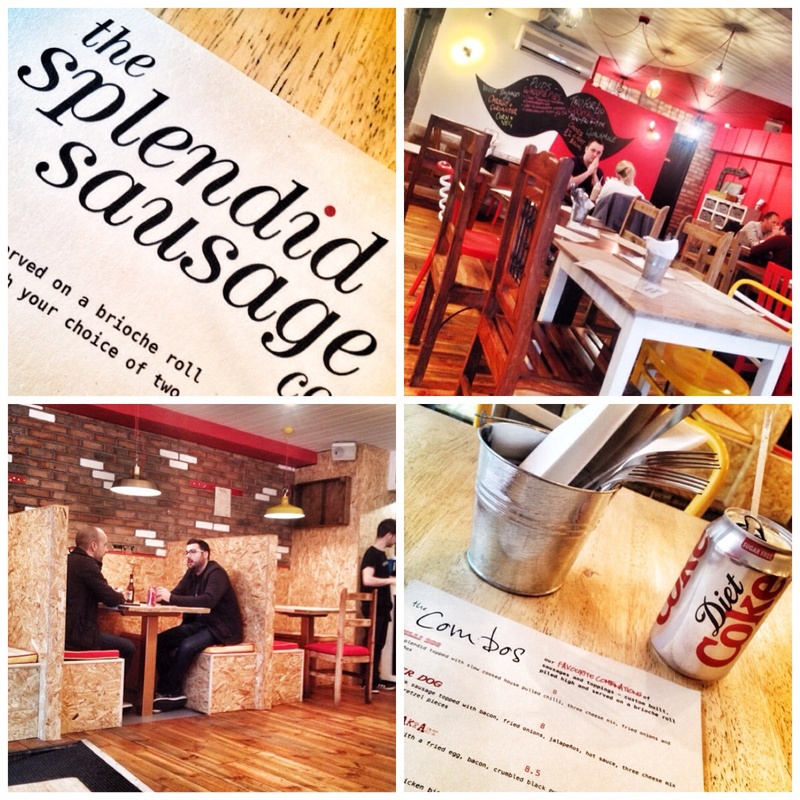 It’s now called ‘The Splendid Sausage Company’. I wonder if it is splendid? Let’s find out. I gingerly headed in alone. There wasn’t many people in. A sprightly young waitress, decked in black, with a large white moustache emblazoned across her chest, bound to my rescue. Still doubting whether this was a good move I asked to see the menu. The young blade quickly explained that what we sell here are Gourmet sausages, locally produced as well. I was made to feel rather special and so I thought why not? I nestled onto a small table by the door and ordered a diet coke (Well we don’t want to overdo it do we?). As much as I liked the Jack Spratt grub the decor was a little strange to be honest. The bits of foliage that used to straggle round the large front windows have gone. It would appear the red paint shop has done well. Most of the walls get the treatment along with sporadic members of the chair department. The old banquettes down the left have now been clad in (wait for this) ‘Orientated Strand Board’ or OSB, (I checked this up at B&Q!) to limited effect. The statement piece of the new set is the moustache specials board, the joke moustache seemingly the splendid sausages playful marketing tag. Whilst still on the decor a little bird tells me the red ceiling in the ladies loo is quite something! 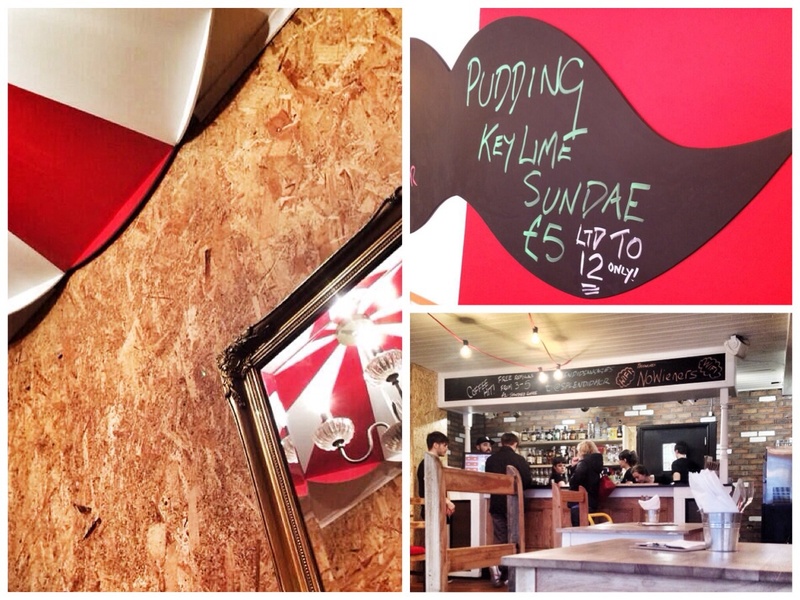 All in all it looks jolly enough and suits the mood and the menu. And so to the menu!. Let’s not beat about the bush it sells hot dogs so it’s a simple affair. 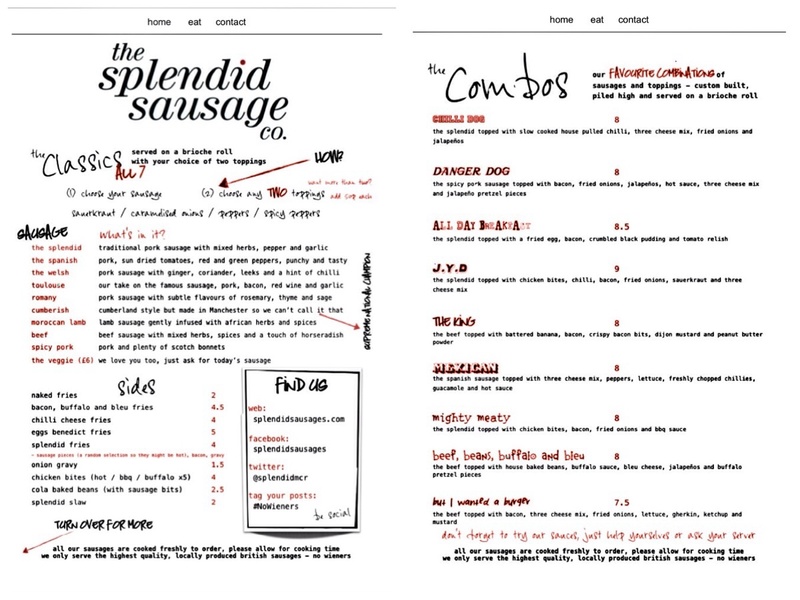 The first side (of the two sided sugar paper print out) explains the routine you need to go through to enhance your hot dog experience. 1) chose your sausage, of which there are ten, including a veggie one. They seem to build up from the humble pork sausage up to a spicy one via a bit of Spain, France and Morocco. 2) from there you add two toppings. Alternatively if your a bit lazy and you can’t be bothered choosing, side two of the tablet quotes some custom built combinations (I think you mean ‘combos’, get down with the kids – Ed) with names like ‘Danger Dog’ and ‘The King’. Rather like an ‘Almost Famous’ menu you then get numbers by the side, like 8.5 and 9. Sadly these are not marks out of ten. A short inquiry with one of the mustachioed crew revealed these numbers represent the price in pounds sterling! 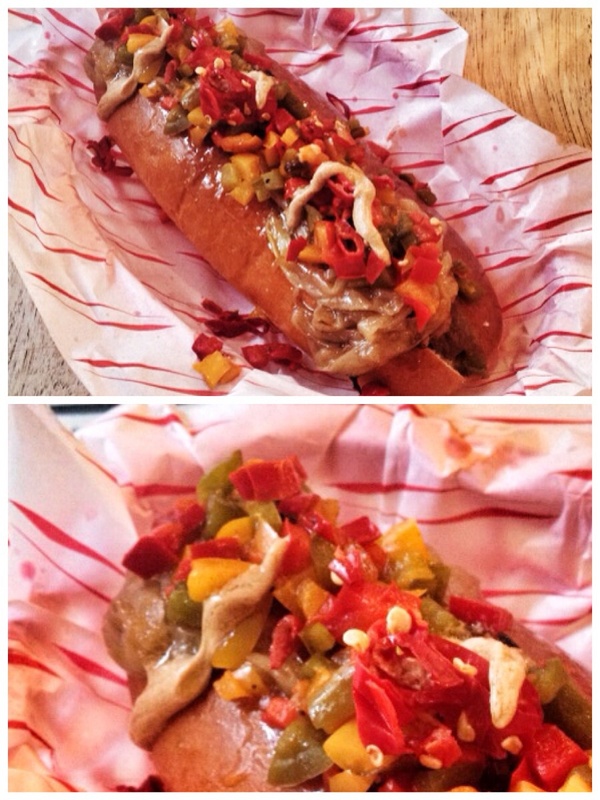 £9 for a hot dog! I went for the Spanish version which contained peppers and sun dried tomatoes. I topped it with caramelised onions and spicy red and green peppers. I then lashed on some PB mustard for an extra edge. I washed it down with my can of coke complete with straw! The whole ensemble complete with the now obligatory brioche bun, came resplendent in its own plastic basket (another nod to Almost Famous, are they related?). If I’m brutally honest a hot dog would be pretty far down my list of gourmet food. But to be fair it was pretty good as hot dogs go. A far cry from the rubbery fairground version. The sausage was nice and spicy, the toppings plentiful and tasty. The bill total was £9. Seven for the dog, two for the coke. Was it worth £9? I’m struggling a bit there. It was all over in a few minutes. The desert menu looked good though and I understand it gets a bit more grown up later in the day selling decent cocktails. Would I go again? I may try a Danger Dog but I think that would be it for me. I think its one for the kids this. It did fill up while I was eating and was pretty much full just after one o clock so it seems to be catching the imagination. So good luck to it I say, keep the dogs barking!